Last evening, DH and I spent some time in garden, just as the sun was setting. Here are a few pictures. We’re planning a plant sale this afternoon from 4:00 – 6:00. Stop by if you’re in the area. 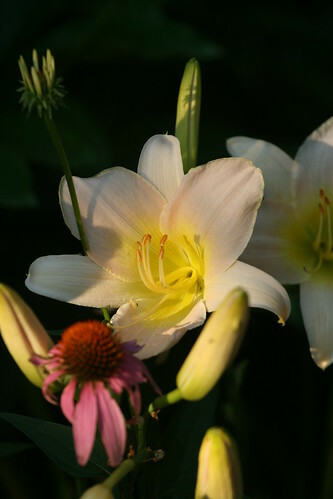 You can visit other gardens on Tootsie’s blog. This entry was written by ~~Rhonda, posted on July 9, 2011 at 9:31 am, filed under our garden. Bookmark the permalink. Follow any comments here with the RSS feed for this post. Post a comment or leave a trackback: Trackback URL. Beautiful! What a nice place for an evening stroll. Oh my! Your gardens are beautiful! Love all the color and the lay outs too! Where are you located? We like a lot of the same flowers! thank you for your nice note and the great feedback. I’ll remember to include shots of the entire garden going forward! I think it helps too! Thanks for stopping by and your nice comments. 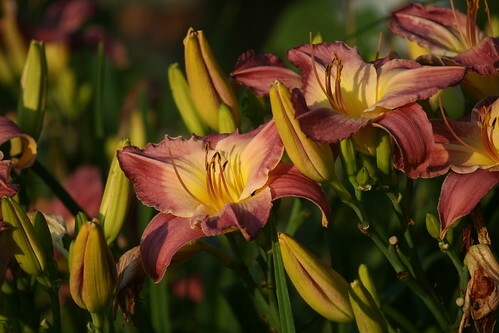 I looked up the red daylilies you suggested and they are nice. I like mostly big, bigger the better. Mary Ethel ANderson was so cute though. Do you use Tinker’s Gardens Database? 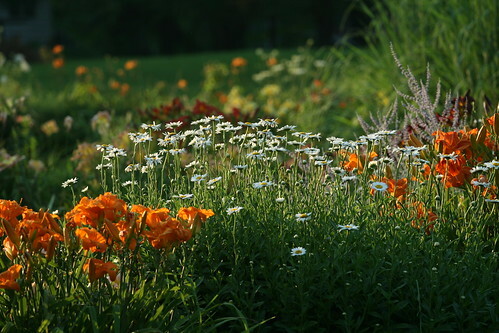 Your flower beds look so tight and compacted and full. Very pretty. Debbie, we are in s. IL, zone 6b. Pat, yes, I am so grateful for Tinkers. It has helped me so much! 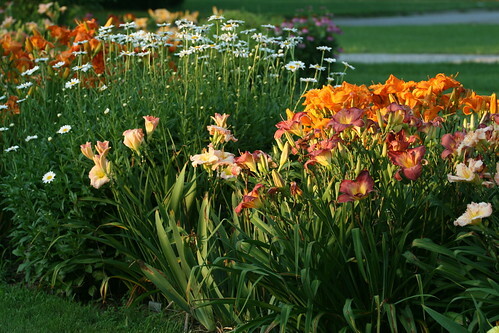 Also the AHS (American Hemerocallis Society) database is hugely helpful. 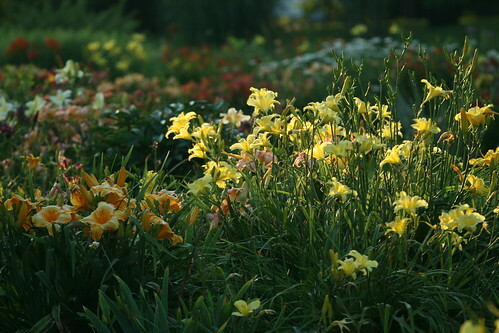 There are daylilies I have not found in either database, but did find by googling the name. 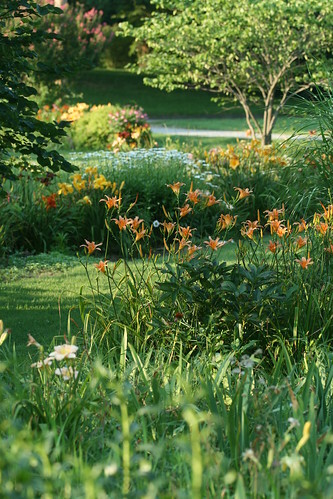 Rhonda, Your daylilies and daisies look stunning! 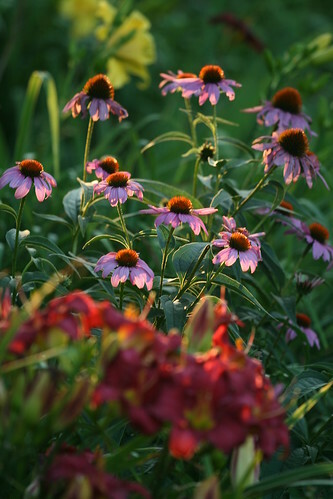 I like your photo with the coneflowers at dusk as well. So, so gorgeous! Your borders look stunning. 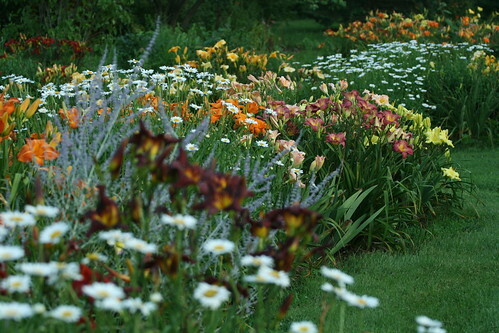 I love the huge drifts of colour and the colour combinations are terrific. Great photos. I scrolled up and down several times taking it in. Wow. What beautiful flowers. I live in your planting zone, too, but I can’t grow daisies for nothing. Your gardens are so pretty. Thanks for visiting my blog. I love your gorgeous flowers (and your gorgeous children). And I especially love that your blog features a year round reminder of how long it is until Christmas. A girl after my own heart! OMG this place is gorgeous! I am in love with these gardens!!!! I am betting they are filled with butterflies and bees!!! thanks for linking in this week. I am always in awe of all the different flowers everyone flaunts. It is a pleasure to tour and see all the gorgeous blooms…and I always enjoy stopping by here! I hope you will link in again soon!